This week, we signed up for a CSA. If you're not sure what that means, it's Community-Supported Agriculture. Basically you buy a share in the produce of a farm & in return, you get a portion of the produce that year. This means that consumers help support the farmer, sharing the risk & reward of the season. It's a great way to support small, independent growers (often organic) who are struggling to survive alongside huge agribusiness. We've joined the Tinka Orchard CSA, which means we'll be getting several deliveries of fruit (plums, pears & apples) in the next three months. (Thanks to Erin for letting us know about them!) We're told to expect about 100 pounds of fruit, which works out to just $2.50 per pound--a great deal for pesticide/spray-free (basically organic, but not certified) produce! Because we're going to have large quantities of fruit at a time--we should be biking our first box of 25 pounds of plums home next week--we'll need to be organized about preserving a lot of it. 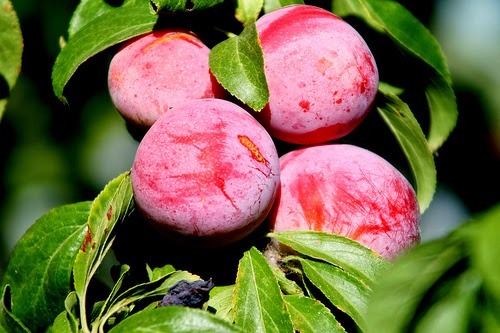 Got any great recipes for things we can make & freeze (or dry or can or whatever) out of plums? Please share them in the comments! Argh--sorry, I meant to mention that in my post. When I emailed, we'd just missed out too, but they kept our name on the list. Then someone backed out last-minute so we got that last spot.